This video uploaded to Youtube by a Rottweiler owner shows the reaction of a Rottweiler dog towards a fake bear. The uploader explained: "There is a tiny chance to meet bears for us so this was a great way to see what happends. There was some straws from a bears winter nest on the groung, bear fur and bear poop so scent was as real as it gets for the dog." 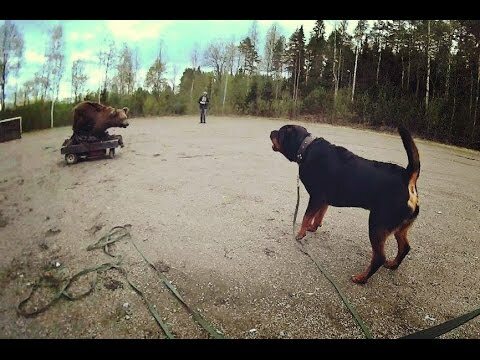 In the video you can see the dog as he approaches the bear as soon as he sees it, and then comes back and stands in front of the owner in a protective way. "The bear guy said that i don't have to worry about bear attacks when i have my rottie with me , the way he acted would scare the bear away." the owner added.